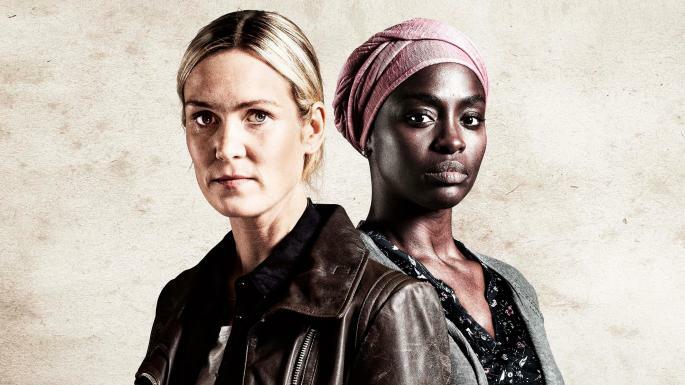 Lynn Rafferty and Aïssa Maïga star in RTE's new drama, Taken Down. RTÉ’s new crime drama, Taken Down, which aired on Sunday the 4th of September, is perhaps the most important production the national broadcasting service has produced in years. The show centres around the murder of a female refugee who was staying at a direct provision centre in the north side of Dublin city. The hit new series has underlying themes of racism and prejudice that Irish television has failed to address until now. The first episode begins with a depiction of Nigerian refugee Abeni, played by Aissa Maiga, on a boat with her two young sons dressed in golden thermal blankets. Once their identities and finger prints are established, we find out that the woman’s husband was killed on the journey over. The widow and her two sons are placed in direct provision where their basic human rights of shelter and food are facilitated. As the story progresses, the death of an asylum seeker whose body is found dumped outside the centre puts everyone staying and working there under the Garda microscope. Suspicion is aroused from the manager Wayne (Brian Gleeson) and Algerian Refugee Samir (Slimane Dazi). The sub plot follows Abeni’s anxiety of deportation. Her now teenage son Isaiah (Aaron Ado) has also found himself in the middle of the investigation after he had been texting the victim. She directs Isiah not to get involved as she fears it may subsequently lead to them being denied asylum in Ireland. Isaiah articulates this to her son who responds in a Dublin accent, “Sure they can’t deport us Ma, I’m more Irish than I am Nigerian”. Dazi’s character is a father figure to most at the asylum centre. His expression and gesticulation are characteristic of a man who has seen enough malevolence in the world. In a scene where he is arrested by Garda Fitzer (Sean Fox), Samir’s humanity is presented to us. He had been antagonised by Fitzer to the point where he pushed him down a small flight of stairs. Fitzer violently arrests Samir while thrashing his room and calling him a pervert after finding pornographic material in his room. He is stripped of his dignity and one profound line articulates his frustration, “I am not a pervert, I am not even a man”. In a later scene, we find Samir on his prayer rug performing Salah. His prayer is rudely interrupted by a maintenance worker who steps on his rug. Samir doesn’t react but has a look of helplessness in his eyes. The episode ends with Isiah finding Samir hanging in his room, showing that his suffering had found its breaking point. There are currently more than 5,000 asylum seekers in Ireland. The Irish mentality of, “we have to look after our own first” is echoed throughout society. The ground-breaking storytelling and narrative of Taken Down is showing us the struggle and suffering refugees in Ireland face. It paints a picture many of us haven’t seen before by humanising characters, which is testament to the acting in the show. It is easy to forget that less than 200 years ago, our country had emigrants fleeing from famine and British occupation. We were once refugees. We once had to face adversity and murderous conditions. We were once discriminated against. Of course, it is important that Irish citizens are accommodated, but we cannot be bigots and hypocrites any longer. The show is tackling societal issues our nation has left on the long finger for too long. Even the casting of two female leads, Lynn Rafferty and Aissa Maiga is showing how RTÉ is becoming a progressive institution.